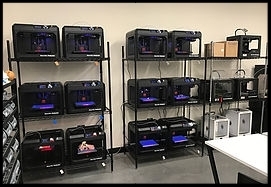 In September of 2016, Mount Olive High School opened its doors to a state of the art Makerspace know as the "The Marauder Innovation Learning Lab" (MiLL). The MiLL is home to the Loggerhead ROV Program as well as our Industrial Design and Engineering courses. In our Fabrication Space, students have the opportunity to collaborate and create prototypes of their designs. Students learn about the design process: research, ideation, sketching, prototyping, testing, and iterating. The 3D Printing Lab allows our students to design, prototype and iterate their solutions in a quick and timely manner. This lab greatly improves our team's productivity and efficiency when designing our ROVs. The Thinker Space is a comfortable and mobile environment for small group meetings and presentations. We hold our team's design review meetings as well as other critical presentations that have an impact on our team's ROV development.